Ashleigh Murray, a Golden Lions referee, had her biggest opportunity so far when she went off to Hong Kong to referee the women's qualifying matches on the most famous of Sevens experiences. The teams in the qualifiers were hoping to play in the Rugby World's Women's Sevens series whose next round is in Kitakyusyu, Japan, on 21 April. The teams taking part in this qualifying tournament were Argentina, Belgium, Brazil, China, Hong Kong, Kazakhstan, Kenya, Mexico, Papua New Guinea, Poland, South Africa and Wales. The qualifying team was China who beat South Africa 31-14 in the final. Ashleigh was one of six referees - Emily Hsieh (USA), Lauren Jenner (New Zealand), Tyler Miller (Australia), Ashleigh Murray, Madeline Putz (Australia), Katherine Ritchie (England). Her father, Gregg Murray, went along with her as support so far from home. That Ashleigh was refereeing at all was Gregg's idea. He was a keen member of the Golden Lions Referees' Society. He and Ashleigh were watching a match at her school, St Martin's in Rosettenville. She kept asking about the laws and he, possibly irritated, suggested that she become a referee. At 22 years of age, she was at Hong Kong in an international group of referees with doors opening already. Ashleigh has been invited to referee in Germany on the 20 and 21 April 2018 at the Bonn International Sevens Tournament in Cologne. The teams playing will be Austria, Belgium, Czech Republic, Finland, Germany, Netherlands and Sweden. In the qualifiers, Ashleigh's top match was the semifinal between China and Belgium. Being a South African disqualified her from the final as South Africa were playing. World Rugby's Sevens coach is Craig Joubert, who refereed at many Sevens Series and achieved high honours in the 15-a-side game, refereeing 69 Tests as well as finals of the World Cup, Super Rugby and the Currie Cup. Like Ashleigh, Joubert started refereeing at school and on a father's advice. Joubert said of the refereeing at the women's qualifiers: "The six girls we had at the Hong Kong qualifiers all did really well. It was great to see Ashleigh refereeing on an international stage and also great for me personally to catch up with her Dad in Hong Kong, who so often acted as a liaison in Johannesburg when I’d come to referee Currie Cup rugby." The man in charge of Sevens refereeing is Paddy O'Brien, one of the best-known referees in the rugby world. An officer of New Zealand's Order of Merit, he refereed 27 Tests, Super Rugby and New Zealand's provincial matches. 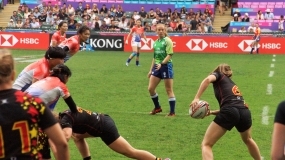 O'Brien knows refereeing and he said: "This was an opportunity for the six girls to showcase their skills at a High-Performance level, and each and every one of them showed they have a future in the women's Sevens game. "Ashleigh impressed as a young woman who has an excellent understanding of the game and will be a valuable referee at the elite level in years to come." Photo: Ashleigh Murray refereeing the semifinal in Hong Kong.